Nobel Prize In Physics: Rainer Weiss, Barry Barish and Kip Thorne Win For Gravitational Waves : The Two-Way For years, three physicists worked to prove Albert Einstein's idea that gravitational waves are rippling through space-time. In 2015, they made history as part of the LIGO Collaboration. 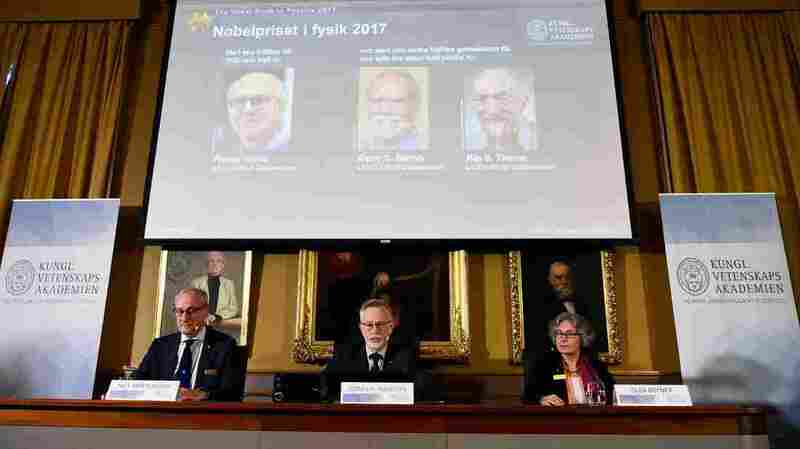 Nobel Committee for Physics members announce the 2017 Nobel Prize winners at the Royal Swedish Academy of Sciences in Stockholm. The laureates are (from left) Rainer Weiss, Barry C. Barish and Kip S. Thorne. Three colleagues, Rainer Weiss, Barry C. Barish, and Kip S. Thorne, have won the 2017 Nobel Prize in physics, for their contributions to work that led to the observation of gravitational waves — something that happened for the first time in 2015. Speaking of decades of trial and error that preceded their discovery, Weiss said Tuesday, "It's very, very exciting that it worked out in the end." Weiss spoke by phone to the Royal Swedish Academy of Sciences, roughly one hour after he had been woken up by Secretary General Göran K. Hansson. "My reaction was just one of profound satisfaction. That things had worked out in essentially precisely the way that I had expected. And that I had put my own energies in the right directions to help make it happen." Thorne said he's pleased to represent "this superb team that's pulled this off." For years, physicists tried to find ways to detect ripples in the fabric of space-time. In the 1980s, Weiss and Thorne — along with Ronald Drever, who died this past March — proposed building a facility that could detect the gravitational waves that had been predicted by Albert Einstein in his General Theory of Relativity. In 2016 — 100 years after Einstein published his idea — the physicists published a paper detailing how they had detected gravitational waves rippling from the collision and merging of two black holes — each with roughly 30 times the mass of the sun. The milestone event made Weiss, Thorne and Drever celebrities and earned them a raft of awards, even as Drever's health was failing last year. Barish's involvement began in the early 1990s, first as an investigator and then, in 1997, as its director during pivotal times for the project. The facility the physicists built to detect that event is the Laser Interferometer Gravitational-Wave Observatory (LIGO), which operates two huge detectors in Livingston, La., and Hanford, Wash.
"Each detector looks like a big L, made up of two tunnels 2.5 miles long. It's designed so that if a gravitational wave passes by, it will stretch space along one direction of the tunnel and squish space along the direction of the other. The stretching and squishing changes the tunnels' lengths by a tiny amount, and that change can be detected by lasers." LIGO is run by the California Institute of Technology and the Massachusetts Institute of Technology; it's funded by the National Science Foundation. The LIGO Scientific Collaboration now includes more than 100 institutions and 18 countries. "I can't imagine that now that we have another way to look at the universe that there isn't going to be some enormous surprises. Things that have nothing to do with what we already know." Janna Levin, author of a book about the physicists' life work, wrote about them around the time of last year's Nobels, when it was suspected they might win. The LIGO project, she said, had created a community "dedicated to maximizing the impact of this new device, to capturing the soundtrack to accompany 'the silent movie of our universe.' "
Although three winners were announced, the award is being split in half — one half to Weiss and the other to Barish and Thorne. The prize comes with a cash award of 9 million Swedish krona — around $1.1 million. The winners will visit Sweden for an official ceremony in December. Weiss, 85, was born in Berlin. After his family fled the Nazis, he grew up in New York City. He lives in Massachusetts and has taught at MIT — the same school he flunked out of as a student. Thorne, 77, was born in Logan, Utah, and studied at Princeton before joining the California Institute of Technology. He lives in Pasadena. Barish, 81, was born 1936 in Omaha, Neb. After studying at the University of California, Berkeley, he, like Thorne, worked at Caltech. He lives in Santa Monica. Last year's Nobel in physics went to three theoretical researchers for, as NPR's Camila Domonoske reported, "their insights into the odd behavior of matter in unusual phases, like superconductors, superfluid films and some kinds of magnets." This is the second announcement in a string of Nobel Prize awards that run through Monday. Yesterday, three Americans won the prize in medicine for their work on the circadian rhythm. Madeline Sofia contributed to this report.